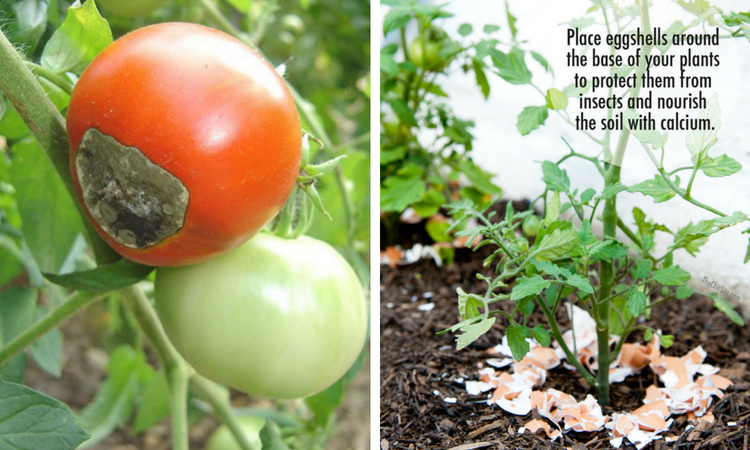 Stop Tomato Diseases In Their Tracks With Eggshells! Ever see a tomato plant with the leaves dying back, or with dark brown tinting on the leaves? Or, have you ever seen a plant full of tomatoes…except all those tomatoes have brown and black spots on the ends that just seem to get bigger? These are symptoms of calcium deficiency – and your garden needs some serious first aid! You CAN fix it – if you’re fast enough! That’s where your leftover eggshells come in. If you have chickens or eat a lot of eggs, you can repurpose your leftover eggshells to improve your garden! Calcium is an essential mineral, and it aids plant development by helping them form healthy, strong cell walls. Without calcium, your plants will experience lags and slow growth, and could die in the long-run. Eggshells, which are mostly calcium, are a perfect way to improve your tomato harvest – and in this article, we’re going to show you how to do just that! Tomatoes can develop blossom end rot – which is a symptom of not having enough calcium. Should your tomatoes develop this disease, you can add crushed eggshells directly to the soil to help your plants. Despite common belief, you can help a plant that’s developed blossom end rot, and the plants can produce healthy fruit once they’re no longer calcium deficient. Before adding them to your garden, grind the eggshells in a blender or with a mortar and pestle to make the calcium more bioavailable. You can then mix the powder with water or add it directly to the soil. Just note that adding eggshells to your garden before the planting season will help prevent blossom end rot, and it’s better to prevent than to fix it. While you can add eggshells directly into your garden, taking the extra step to compost them is also a good idea. As they degrade, they’ll help neutralize the pH of your compost, as well as leave rich minerals behind. Be sure to wash and crust them before adding them to your compost so they won’t attract insects and other animals and so they break down faster. Another idea, if you’re feeling creative or truly committed to making sure your tomatoes have enough calcium, is to start your tomato plant seedlings IN eggshells. When you transplant them, you can transplant the seedling AND the eggshell (which you’ll bury directly into the soil). Whenever you start your tomato plants, clean out eggshells, leaving most of the shell intact. Place potting soil in the shell, and then insert your tomato seed. As it sprouts, it will get nutrients from the soil, and the shell will continue to feed it long after it’s been transplanted (you should still side dress with compost when it flowers, however). Coarsely crushed eggshells have the ability to develop a strong and highly effective barrier against the incidence and occurrence of pests such as slugs and snails, which also happen to love chomping down on tomatoes. Slugs and snails have soft bodies, and the sharp spiky shells can cause some deadly harm – so the pests avoid the ragged eggshells at all costs. Simply arrange the crushed layer of the eggshells around your tomatoes, and you can rest easy that snails and slugs will find something else to eat for dinner.